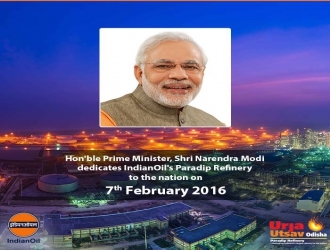 Prime Minister Shri Narendra Modi inaugurated the state-of-the-art Indian Oil’s Refinery at Paradip in the State of Odisha with a capacity of 15 MMTPA (Million Metric Tonnes Per Annum) on 7th February, 2016. The refinery is designed to process high sulphur heavy crude oil. It will produce 5.6 million tons of diesel, 3.79 million tons of petrol and 1.96 million tons of kerosene/aviation turbine fuel, 790,000 tons of LPG and 1.21 million tons of petroleum coke annually. The Indane Maximization or INDMAX Unit at the refinery, developed indigineously by the Indian Oil, is designed to produce 44% LPG, the highest from such plants. The commissioning of the INDMAX Unit with the capacity of 4.17 million metric tonnes per annum marks a major milestone in the history of Indian refining. With this technology, Indian Oil is globally recognized as a technology supplier. Other technological features such as flue gas desulphurisation facilties and vapour recovery system from jetty loading will ensure environment-friendly operation of the refinery with minimum impact to the eco-system. The Refinery is one of the most modern refineries in the world and will produce petrol and diesel of BS-IV quality and will switch to BS-VI quality later. The refinery is also designed to produce Euro-V premium quality motor spirit and other green auto fuel variants for export to advanced countries. The Paradip Refinery is Indian Oil’s 11th refinery. It was built over a period of 16 years at the cost of Rs.34,555 crore (US$ 5.16 billion). It is expected to unleash a new wave of industrialization in the hydrocarbon sector and accelerate economic development in Eastern India. An India-Kazakh Joint Venture, KazStroyService was one of the main EPC (Engineering, Procurement and Construction) contactors for the project. It provided a range of services such as production facilities, tank forms, pipeline construction, mechanical and electrical works as well as instrumentation, insulation and refractory fabrication works for the refinery.